Looking for a cute, animal-filled physics puzzler? Deqaf Studio has you covered with their latest title, Furtive Dao... Looking for a physics puzzler full of martial arts and quicktime, precision moves? Deqaf Studio has you covered with their latest title, Furtive Dao. No, these aren't two different games. These two seemingly opposite descriptions are both encompassed in one, fun experience and all under a heartwarming storyline that will have you going awww! 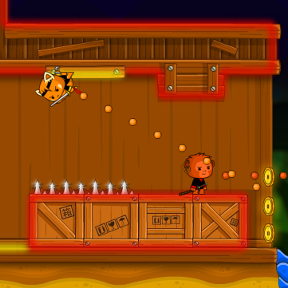 Control the giving red panda with your mouse by clicking and holding to set a trajectory for him to take out a variety of enemies and collect coins and treasure chests. Over the 30 levels, you'll encounter more difficult situations and have to use more strategy to complete the level in the limited number of moves. Enemies that kill on sight, ones that shoot from a distance, platforms you can jump through, ones you can't, planks you can hang from... this game has them all! Get everything right, and you can spend the coins you earn in each level on helping to save a poor, dilapidated orphanage. Quickly, now, a building full of poor children are depending on you! Furtive Dao Walkthrough now available! OK, so this is my attempt of making a whole walkthrough of the 30 + 6 levels in the game. I hope you will find it useful. I also thank rdunlap1125 for posting the solutions to 22 and 29, as well as the general tip, all of those I included or adapted in the walkthrough. For moves where you have time, hold the button down and you'll get a tracer showing your path. Useful when you need a little extra precision. Not only that, but in this mode you are able to see which objects are passable and the line of sight of the opponents, which is useful for sneak attacks. 1. Jump to the upper bar. 2. Jump to where the coin closest to you is. 1. Jump horizontally so that the next move you are aligned with the right guard and the upper level, where the two coins are. 2. Jump to the upper level, collecting the coins and killing the guard at the same time. 3. Kill the left guard. 1. Jump to where the first coin is. 2. You are spotted but no worry. Jump to where the coin below you is. 3. Jump to the coin on your right. 4. Kill the guard when his back is facing you. Every good platform game has spikes. Obviously, you can't touch them. 1. Jump through the spikes to the right coin. try to be as left as possible, while catching the coin. 2. Jump to the upper right corner, picking up the 4 coins in the process. 3. Jump to the remaining coins, killing the guards in the process. And now comes the chest. The chest is an item that you have to press 9 times consecutively with the left mouse button in order to open it. In levels where it exists, it provides the most of the score (roughly 4 of the 5 coins you win if you "beat" the level). 1. Jump to the chest when the left guard is in the line of sight. Open the chest. 2. Jump to the lower level, killing the right guard. Do this when the lower guard is facing left. 3. Jump to the leftmost coin, killing the bottom guard in the process. 1. Jump to the upper right platform. Don't care about those coins nearest to you just yet. 2. As the left guard is at it's rightmost position, jump to him. 3. Jump to the vertical stack of coins, killing the center guard in the process. Here we are introduced to a new foe: the spearguard. If you haven't noticed before, regular guards can be attacked heads on, if you are far away enough. Spearguards require you to attack them from behind. 1. Wait a little, as for the spearguard to reach left and then head back. Kill him when his back is turned. 2. Jump to the rightmost position in the map, collecting all coins. 3. As soon as both guards line up, jump to the upper guard. This level requires some timing. 1. As soon as the center guard reaches the left coin, jump to him. 2. As soon as the upper guard reaches it's rightmost position, jump to him. 3. As soon as the bottom spearguard lines up with you and the bottom coins, jump to him. Some precision and timing is needed. 1. As soon as the first guard turns it's back, kill him. 2. As soon as the second guard turns it's back, jump to the top coin. 3. Quickly, kill the second guard. 4. With some precision, kill the last guard as he nears the ledge. Here we are introduced to an object called "piece of wood", that I will refer onwards as "platform" (it just sounds better). You can hold on to it for a period of time that's roughly about 5 seconds, at that time you will fall into whatever is down you. 1. Jump to the first platform, collecting the 3 coins. 2. Jump to where the second stack is, killing the first guard in the process. 3. Jump to the second platform. 4. Jump to the last coin, killing the guard in the process. 1. Jump to the left platform. 2. Jump to the right platform, collecting the coins and killing the spearguard. 3. Jump to the upper platform. 4. Jump to where the leftmost coin is. Fall and open the chest. And now comes the archer. The archer has something of a 90 degree line of sight, depending on where he is faced. If the archer sees you, he will begin to shoot arrows at you that obey standard physics. Awkwardly, the archer checks to see if you are within his LOS right before he fires the next round, so it's possible to outrun him, albeit not worth the effort. The arrows can pass through objects, so whenever an archer appears, move fast. 2. Jump to the left, collecting the two coins. 3. Jump to the bar above you. 4. Jump to the upper bar. If you were in a rush, wait for the archer to fire it's arrow, as most likely it would hit you when you reached the upper bar. 5. Jump to the archer. 1. Jump to the lower left guard. 2. Jump to the rightmost position, collecting the coins and killing the guard in the process. 3. Jump upwards, killing one of the archers and collecting the coin. 4. Jump to where the center archer is, collecting the remaining coin. 1. Jump to the leftmost position, killing the guard. 2. Jump to the upper platform, collecting the coins. 3. Jump to the center bar where the 3 coins are. 1. Jump to the upper platform. 2. Jump to the right platform. 3. Wait for the guard to turn it's back, then kill him. Jump so as you become aligned with the Asian building's ledges and the coin. 4. As soon as the guards align, jump to where the coin is, killing them in the process. 1. Kill the bottom guard. Make sure he is as far as right as possible. 2. Click on the left upper corner (as if you were falling to where the treasure is). Be wary of the spikes. try to open the treasure as fast as possible. 3. Jump to the left platform. 4. Jump to the archer, collecting all remaining coins in the process. This level you will need to move relatively fast, as the center guard's timing is fundamental to completing in the least amount of moves. 1. Wait for the right guard to notice you. As soon as he notices you, jump to the center left platform, grabbing the two coins. 2. You can either wait until you fall or kill the bottom guard as soon as he faces the other way. Position yourself as so you have a clear line of sight to the center right guard. 3. While the center guard is facing left (and the center right is facing right) kill the center right guard. 4. Kill as fast as possible the center guard, collecting the two coins in the process. 5. Jump to the upper platform. 6. Kill the archer, collecting all remaining coins. This level you need to have impeccable timing, precision and some precognition. 1. Jump to the spearguard. 2. Jump to the archer (that noticed you), collecting the coin. 3. Due to the physics of the game, as soon as you kill both guards the level ends. So, you need to target the uppermost coin, while killing the upper guard, not killing the center guard, and avoiding the spike trap. Assuming you were successful, open the chest. 4. As soon as the center guard reaches the left ledge, jump to where the leftmost two coins are, as if you jump well, you will get the right coin as well. And now appears the shield guard. You need to hit him twice. You can't face him heads on. 1. Jump to the chest while the shield guard is facing right. Open the chest. 2. As soon as the right guard is aligned with the bottom coins, jump to the coins, killing the guard. 3. Jump to the upper platform when the guard is facing left. There is more than one way to solve this level, so the solution I post here might not be the best. It just works. 1. When the right shield guard is near the ledge, back facing you, jump to a position up to where the coin and chest are but not so up as you get to the bar. Open the chest. 2. When the right guard's back is again facing you, jump to where the upper coins are. 3. Some precision and waiting is needed. As soon as the center guard and the left guard are aligned, jump to the guard. 4. Jump to the shield guard, killing him. 5. Jump to the last coin, killing the archer in the process. This level does require some precision and can have varying results (i.e. you can finish it in one move less). 1. Jump to where the coin above the shield guard is. It is possible to target the archer but it is tricky. It is required you pass through the shield guard though. 2. Quickly (as to prevent the shield guard from killing you), jump to the left platform. 3. Jump to the upper center coin (above the chest). Open the chest. 4. Time this right. Jump to the right platform and fall, as so the archer doesn't see you and the shield guard is well positioned. 5. Kill both the archer and the shield guard. Here you are introduced to the last enemy: the monk. The monk is quite nasty. As soon as you enter a set radius of him, he instantly kills you. You can kill him by slicing a chain connected to a pass through box. 1. Go straight up to the second level. 2. The key move -- take out the second level guard at the far *left* of the platform, just as he has turned. You want to be at the left edge of the platform. 3. Diagonally cut back across to the chest on the third floor -- you can pass through the box. Be sure not to cut the chain. Unlock the chest. 4. Fly straight across to pick up the three coins, cutting the chain in the process. 1. Wait for the left spearguard to face you. As soon as he faces you, jump to the left platform, cutting the chain. 2. As soon as the monk's killed, the spearguard is instants away of turning back and seeing you. At that time, target the rightmost bottom coin, killing both the spearguard and the left archer. 3. Go to the chest. Open it. 4. Target the remaining coins, killing the right archer. You are falling, the left archer notices you. Be fast. 1. Jump to roughly where the last coin is. DON'T jump to the platform. 2. Jump to the upper right platform. 3. Jump to the upper left platform, cutting the chains and killing the monk in the process. 4. Kill the right archer. 5. Kill the left archer. You are "reintroduced" to an enemy (because he is the 1st enemy you find in the game), which I would like to call the "arquebusier". As soon as he is spooked, he begins shooting at where you are, in 3 second intervals. His shots are blocked by the same objects you can't pass through. 1. Kill the upper left guard. 2. Kill the center left spearguard. 3. Kill the center right spearguard, cutting the chain, killing the monk and spooking the arquebusier. Avoid being right at the ledge. 4. Wait a little as to get maximum advantage of the short time you get. As soon as he shoots, jump to the chest and open it. 5. As soon as it is opened, kill the arquebusier before he lands the next shot. 1. Kill the upper guard. 4. Jump to the upper platform (where two coins are), killing the guard in the process. This is somewhat tricky (because of the box), try to position the cursor as right as possible while connecting with the platform. 5. Kill the archer, the spearguard and the guard in the lower left platform all at once. 6. Kill the remaining guard. 1. Time your jump accurately. As soon as the spike traps are opened, jump to where the coins are. 2. There exists a horizontally moving spike block below. As soon as he passes the chest, moving right to left, jump to it and open it. 3. As soon as it is opened, kill the right guard. 4. Kill the spearguard above. Again, timing is the key. 1. Jump to the upper platform, the archer will notice you. 2. Jump to the left platform, killing the archer. 3. Kill the guard below. 4. Jump to where the chest is, open it. 5. Time the spearguard's and the spike trap's movement. Kill the spearguard when the moment is right. 1. Move to the far right edge of the bar containing the chest. You should be close enough to unlock the chest. 2. The key move -- jump to the top of the column of coins on the far left. Set up your path to clip through the far left edge of the top platform while the guard is there (the tracer is useful for this). You should fall to the bottom behind the purple guard. 3. Easy from here, but for completeness -- jump to the right, taking out the spearguard and the archer. 4. Jump to the center right platform when the spike blocks are moving away from it. 5. Kill the remaining guard. You now have a final challenge with the arquebusiers. You can't touch the bells while moving, otherwise you will alert them. In this particular level you can't hide from their shots. 1. Kill the upper left arquebusier. 2. Kill the upper right arquebusier. 3. Jump to the chest and open it. 4. Target the right platform, as you hit the upper part of it. This can alert a bell, if you go low enough. Let yourself fall down. 5. Target the remaining coins, killing the 3rd arquebusier in the process. 6. Kill the remaining arquebusier. P.S. : There is also another possible solution, if you go to the lower coins first. Summing it up: Lower coins, upper left arq., chest, upper right arq., platform, right arq. You now have infinite turns and (almost) no bad guys to care about. 1. As the blade trap is on the vertical position, jump to the rightmost position. 2. Jump to the upper platform, then jump to the stable ground to the left. 3. Jump through the spike block trap as so you fall through the spiked walls. 1. Jump to the left platform, then to the bottom left ground. 2. Time the spikes so that you can kill the spearguard. 3. Jump from your current position to the right platform, then the upper and then jump to Liu. It may be helpful to wait. The traps "reset" after 4 different configurations. Just see the amount of time all traps in a given vertical corridor take to be in the off position and take it from there. Be careful of the mace trap however. It seems redundant to describe the steps, due to the variability of the level. Again the secret is in timing. But for reference, here is what I would have done. 1. As soon as the spike trap and the mace traps allowed it, jump to below the leftmost bar. 2. Jump to the "divisor" (the solid wall between both spaces). 1. As soon as the level starts and the trap recedes, jump to the left, then to the right platform, then the upper left and then the rightmost platform, cutting the chain, killing the monk. 3. Jump to the right. Note the spike's rhythm. I personally jumped to the 3rd bar, then the 4th and afterwards rescued Kiuyu but any combination should suit you. Ultimately, be as agile as you can. 1. Jump to the left. 2. Jump to the bar below you. 3. Jump to the floor, afterwards to the right. 4. Jump to the bar above you. 5. Jump to the platform above. "Beating" a level (e.g. collecting all coins, opening the chest and completing it in the designated amount of turns will give you 5 coins. The shelter desperately needs renovations (that's why you were doing all these weird missions...) and that money will help you restore the shelter. There are several parts to the shelter that you can improve by spending money. There doesn't seem to be any precedence. When you spend your last coins (i.e. paying the taxes, healing the sick toddler, etc.) you will get the end scene (a thank-you note from the purple tanuki/racoon'ish pal and the game's credits. Consider this as a tribute to a very interesting and challenging game. Expected less ended up getting a good dose of mental challenge and mildly puzzling levels. hm. so far made it up to lvl 18 without a hitch, now can't seem to get level 18 within the number of jumps. You did better than me then, I lost moves after from level 4 onwards. I can't do 9 (at all) and gave up on 15. The game's interesting, but some levels (22, 24, 26 and 29) should be tweaked (adding a single more move) because unless using a bug, there seems to be no way to pass them in the designated amount of moves (or unless they expect millimetric precision). Funny -- that would be my comment about 16, 17, 24 and 26 -- but *not* 22 and 29. 1. Move to the far right edge of the platform containing the chest. You should be close enough to unlock the chest. 3. Easy from here, but for completeness -- jump to the right, taking out the purple and blue guards. 4 and 5. Need to be ready to do these quickly back-to-back due to the spiked boxes. Jump to the clingable wall across from the remaining guard and then take out the last guard. That hint is valuable... The tutorial (Level 1) does show that feature, but it is quickly forgotten as the physics of the game begin to seep in. That and the fact hanging boxes are pass through did allow me to pass Level 22. And on the process... I managed to beat level 24, payed the orphanage's taxes and got a thank you from the purple racoon'ish character. Having passed all levels I feel confortable'ish about writing a walkthrough, albeit that will have to wait, as I have work to do. I'm sure there's a simple way to do it. On your first move, when you jump straight up, you MUST jump far enough to the RIGHT that the spearguard (also on the right) "alerts" -- otherwise he won't start his pacing route and can't be killed in the final move. You know what, I'm sure Shen will grow to love his new home one of these days. There is a quicker way in lvl 30 witch takes only 3 moves!!! 1. Go to the chest. 2. Kill the upper arquebusier. 3. Kill the arquebusier to your right and go a bit further so when u drop u collect the coins and not wake the arquebusier. 4. Now's the tricky part, go to the left place where the 2 coins are and killing the arquebusier and NOT RINGING THE BELLS. 5. Kill the last one on top of u!! This is a very good game; I would just like to submit a revised walkthrough for level 17. 1. Jump to the center left platform, grabbing the two coins. 2. Jump and kill the archer guard. 3. Jump across to the upper platform, collecting the remaining coins. 4: Wait for the center gaurd to face away from you, and kill him. Try to go as far left as possible with this. 5. Wait until the center right guard faces away from you, and kill him. 6. Wait until the bottom guard faces away from you, and kill him. This requires far less timing and effort. It's not the spear-guard you have to alert. Make sure the archer on the middle platform is looking your way when you jump up and grab the board. He'll alert the others.